Our duck hatched out two chicks last week. Yes chicks, not ducklings. The brown one in this picture, and a fuzzy yellow one. The next day the fuzzy yellow one was dead, looks like it got injured maybe. The nest is in the cattle shed, so it could have gotten stepped on. That same afternoon I was out visiting the pigs when I heard this “cheep cheep cheep”. Mrs. Duck had gone to the creek for a bath, and the little brown chick was running around trying to latch on to any hen that passed by. 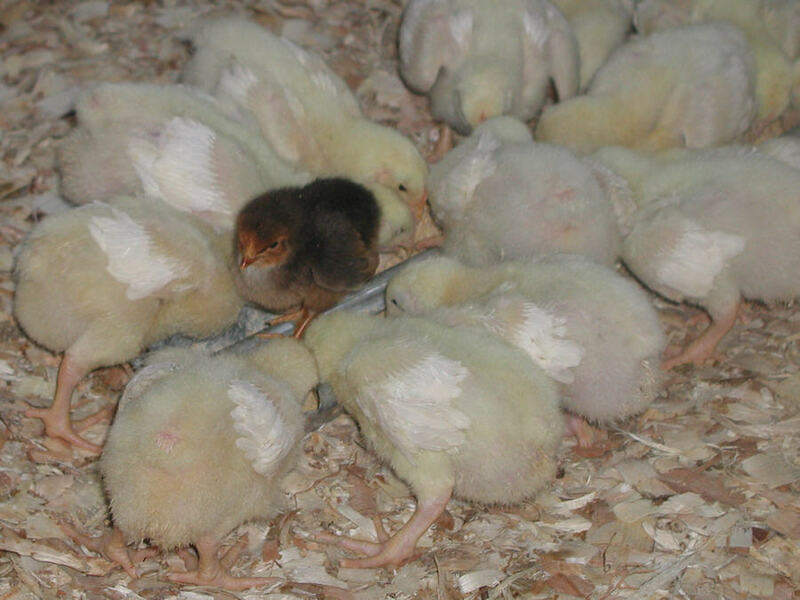 They all ignored him, so I snatched him up and took him inside to the brooder with the broiler chicks. As with almost anything around here, he had to have a name. So chick + duck = Chuck! The broiler chicks are about a week older than Chuck. It’s absolutely hysterical to see Chuck trying to snuggle under the wing of a broiler chick. The broiler chick will just stand there with a look of bewilderment, little Chuck tucked under its wing! Thankfully, they don’t seem to pick on Chuck. This entry was posted in One of these things just doesn't belong here. Bookmark the permalink. Oh my!! You need an Aunty Chicken!! Good thing you had a batch of step-chicks in the brooder! Our Duck Tina is sitting on another clutch and we were planning on giving you some:):):) It is interesting that the chickens and ducks will use the same nest. I was worried Tina was going to hatch out a few chicks too but she pushed the hen’s eggs out of the nest. patti – I’ll have an update on Mrs. Duck coming soon ;)marianne – thanks for stopping by!